It is assumed that fundamental analysis is the only way to catch multi-baggers, and how wrong can it be. Multi-baggers can be found by using simple technical analysis tools, and we will learn what to see and how to stay invested and even add more to our positions. It is observed that most of the time investors buy a good stock but sell off early and then rue their decision to exit. This webinar will help them avoid disappointment, even encourage buying more and staying the course. 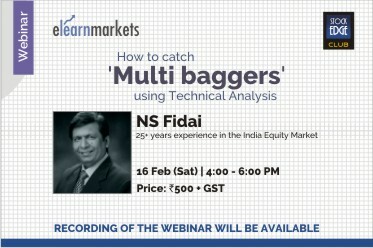 Learn simple tools of Technical Analysis to catch multi-bagger stocks. Using the TA tools to stay invested and add more when you have bought the right stock. Stock & webinar related queries up to 3 per participant. Basic use of charting software will be preferable. N S Fidai is the founder of Analyse India. He envisioned technical analysis as a medium to empower traders and investors with the knowledge to make informed investment decisions. His passion to share his knowledge with keen learners led to Analyse India to foray into the field of education. An ex–Banker with 13 years of experience in the Banking sector, Mr Fidai has an illustrious track record of 25 years plus in the Indian Equity markets, having started off in 1991. In the last 14+ years, Mr Fidai has honed his skills in the art of Technical Analysis and emerged a successful Technical Analyst par excellence. One of the good webinar. This speaker was really good & share the real experience. Otherwise, all other speakers make money out of this webinar. I have attended a lot of webinar on Elearnmarkets but this was a really useful & good one. Good 2 takeaways from this webinar. Good value for money and time. thanks. Reading charts along with the concepts was good. Concepts were explained in very simple language without complication. If we could a pic of the presenter on the first slide/intro page, it makes a great connect for the audience, even in a webinar.